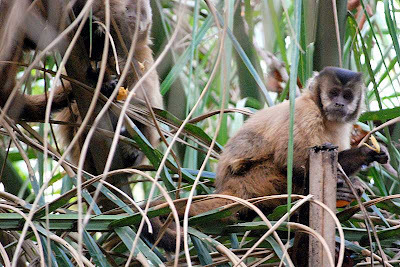 First sighting of capuchin monkeys! 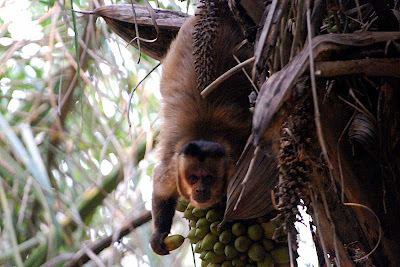 Today we had the first sightings of 3 capuchin monkeys (Cebus libidinosus, macaco-prego) here on Fazenda Barranco Alto. We saw them feeding on ripe acuri palm-nuts (Attalea phalerata) in dense riverine forest. Capuchins are considered the most inteligent new-world monkeys and one of the few examples of primates other than apes, using tools.